I’m not going to lie, I was super bummed when we bought our home a few years back and it didn’t have a fireplace. As silly as it might sound, a fireplace is such a statement piece and creates so much warmth (even with no fire, no pun intended). Christmas’ just aren’t the same without stockings hung by the fire, amiright?! As impatient as I am, I couldn’t wait for us to scrounge the money to “add” a fireplace. 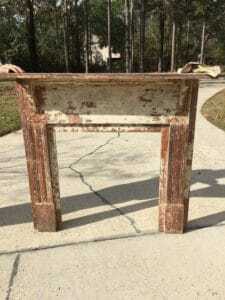 That’s when I decided I would create my own Antique Fireplace Mantel from a craigslist find. You know I love antiques and anything with history. 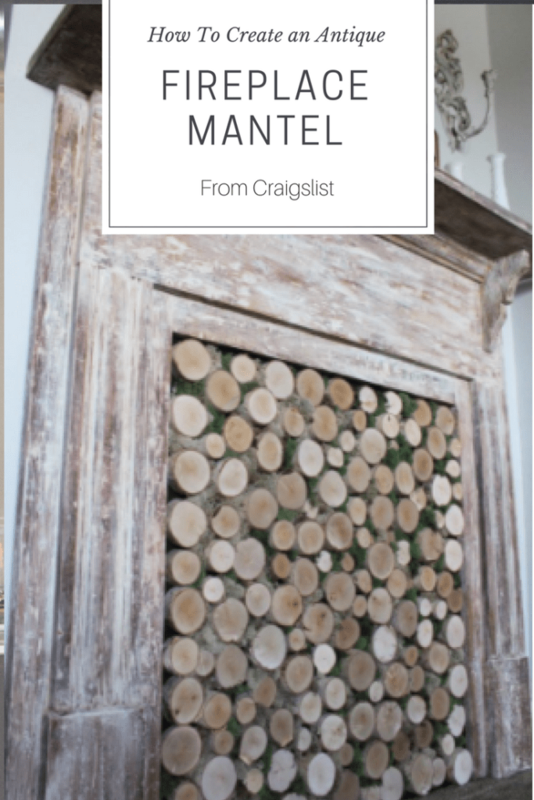 I don’t have much of a budget to work with, so finding a great fireplace mantel was hard. It took me about 6-8 months of searching craigslist and thrift stores to find what I was looking for. 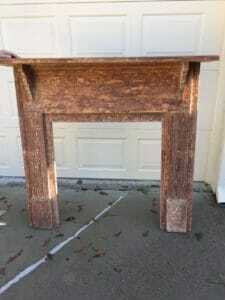 Finally, I found an vintage fireplace mantel on craigslist for $160. Here she is in her original glory! This vintage piece of history was salvaged from an 1890’s home. I could tell there were many many layers of paint and polyurethane that needed to be stripped off. 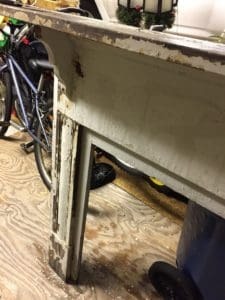 After all, a furniture piece this old was for sure to have lots of lead paint. With my very curious 2 year old, I try my best to keep anything toxic out of our house. The first step in restoring this beauty to gather supplies and begin to strip the paint. By the way, you can see the easiest paint stripping method in my post HERE. I promise, you will be amazed! Note: some of these links are affiliate links. This means that if you purchase from one of these links I will receive a small commission, but rest assured you will pay no more for the product. Paint Stripper – I used the gel stripper that I’ve attached here. It seemed to work well to strip nearly 8 layers off. Gloves – make sure you use rubber gloves because the paint stripper will surely eat through skin! Sander – I’ve attached this sander because it comes with a bag to collect the dust. 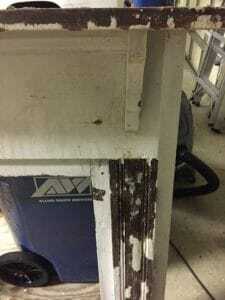 This is VERY important when sanding lead paint because the dust is toxic. And it makes the clean up A LOT easier. Paint stripper after wash – this is an important product to use to remove all the extra “gunk” that the excess stripper and old paint leaves. I followed the instructions on the paint stripper can and began to slowly strip many many layers off of this antique mantel. The fireplace mantel pictured to the left is shown after stripping about 6 layers off. 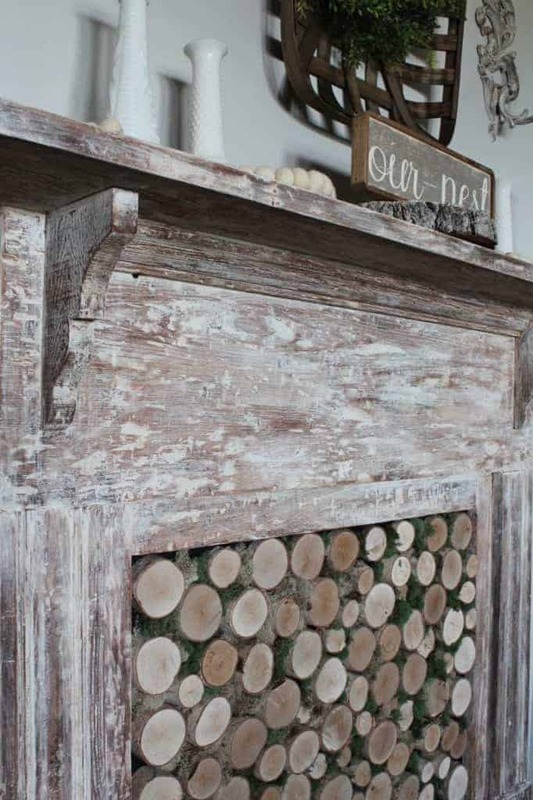 I gave the salvaged fireplace mantel a “whitewash” look. I still wanted to see the wood grain, but I also wanted to mute the red tones from the wood. In order to whitewash the wood, I used a mixture of 50% water to 50% white paint. I used a Valspar white paint, but any white paint will work. I applied the paint with a rag all over the mantel, and let it sit a good 20 minutes to dry. After I made sure the paint was dry, I sanded it with a fairly fine grit sandpaper. Note: I found a great product that lightly white washes wood. It’s called Liming Wax and you can read all about it HERE. 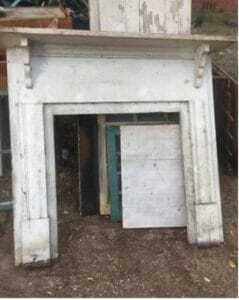 Now that my historical antique fireplace was finished, what would I do inside the fireplace? I wanted to create the look of birch wood in the middle. I was inspired by a photo from the infamous Magnolia Market shown below. Supplies I used to create a faux birchwood fireplace center. Birch Wood – I bought 6 logs and had them cut. If I could do it over, I would have bought them already cut. I thought I could cut the slices down with a table saw, BUT in an effort not to cut our fingers off, I could not cut the logs small enough to use all the wood. Here is a link to birch wood that has already been sliced. Click HERE. 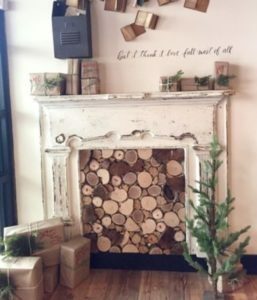 Just an FYI; the measurements for the middle of my fireplace mantel are 30″ by 32″ and I used about 90 slices of birch wood that measured 1.5″ to 3″ in diameter. Black Foam Board – I chose to use black, but you can use whatever color you want. Green decorative moss – I used a mix of green and brown. My antique fireplace was finished! Even though I live in a new home, I love having pieces of history too! 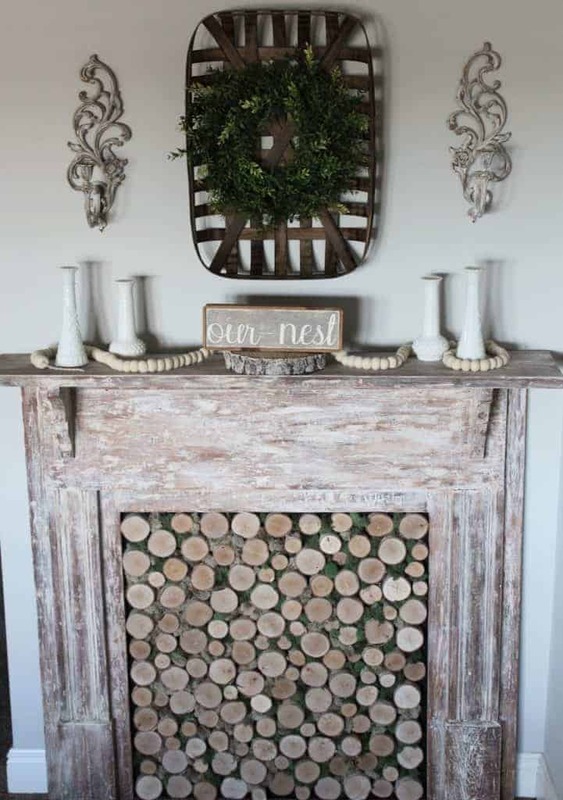 I’m pleased with the way my fireplace mantel turned out and I can’t wait to hang my Christmas Stockings up at Christmas time (and yes, Christmas is 10 months away!). If you enjoyed this post I would love for you to Pin it to Pinterest HERE. Or you can just Pin the image below. 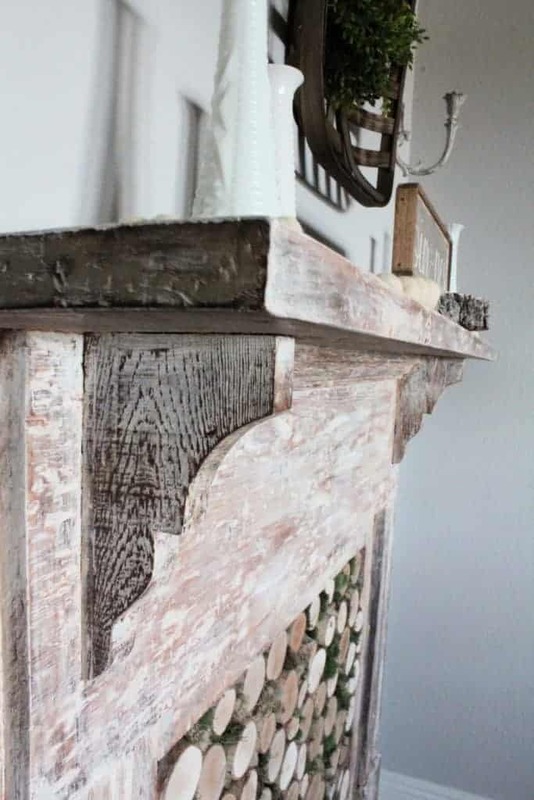 If you’re interested in seeing how I transformed the whitewash finish on this antique mantel to a chippy white finish, you can view my post HERE. 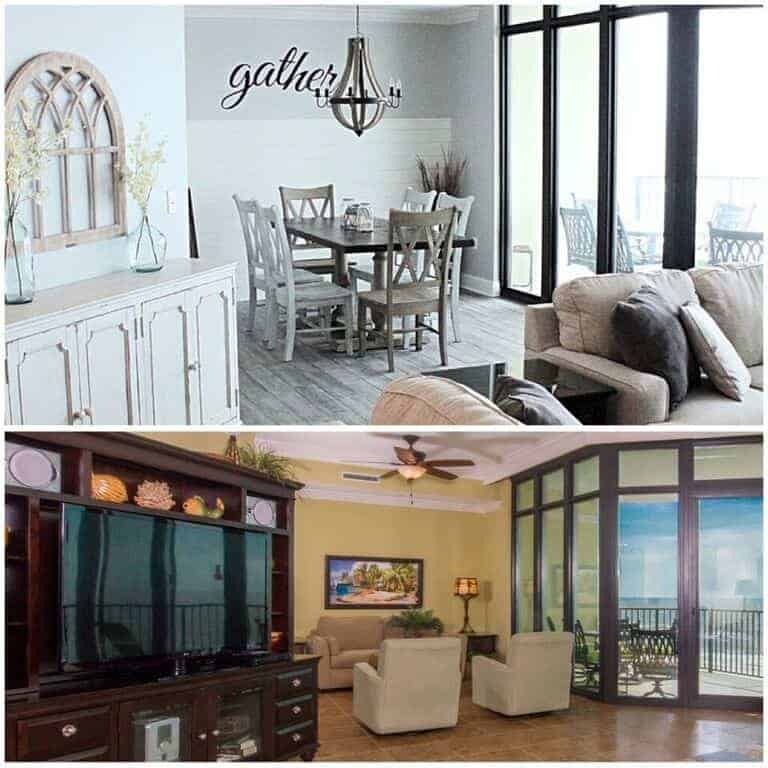 If you want to see more fun furniture transformations click my page HERE. Lindsey, great job! I don’t think I’m willing to do all that myself, but I’d love to have that beautiful addition to my home. What a great craigslist find, and you did a beautiful job of refinishing it. I’m sure it is a perfect focal point for your room. What a wonderful job you have done with the faux mantel. I think it would look so good at Christmas time too. 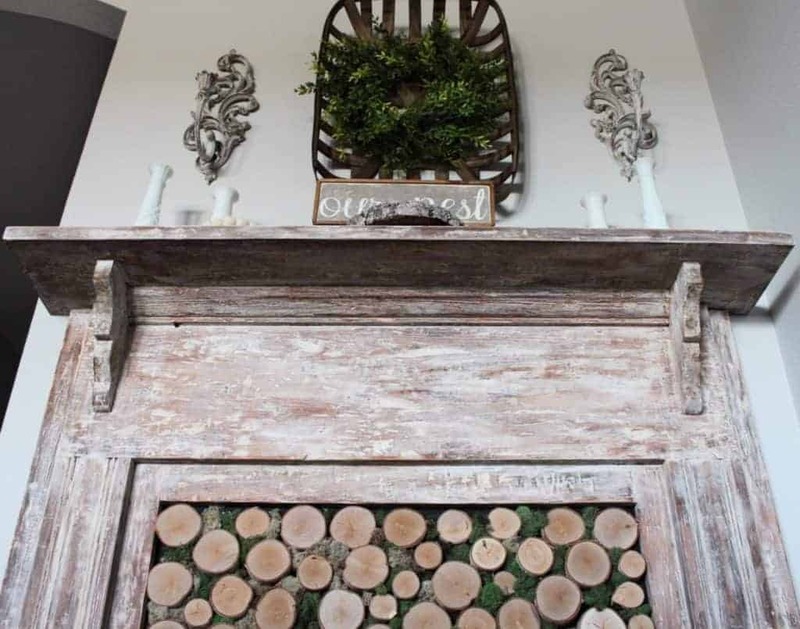 Lindsey what a wonderful salvaged architectural element that really creates a great focal statement, And I love the birch logs! Which I had the room in my place to borrow your project? Thanks so much for sharing it at Fridays Furniture Fix! Michelle this is such a great surprise! Thank you ladies so much for the feature! I love your “fireplace” and the whole vignette. I too did the fake fireplace with antique mantel and I love it. Both of them in fact. I have one in my bedroom too. Thank you!! I have really enjoyed it. I really love your makeover! It is just like having a real fireplace without the mess. 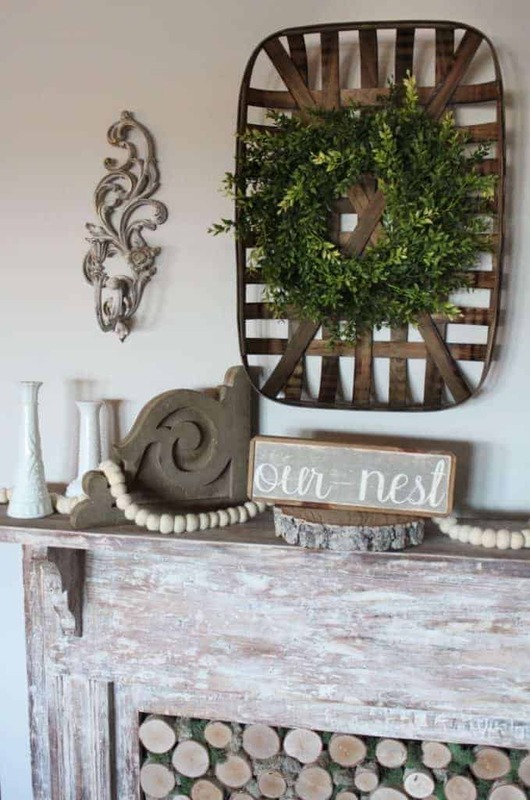 The period your mantel came from is one of my favorites. I live in an 1870 Victorian with a mantel in the parlor. There is a heavy metal plate in front and even a flue but no evidence of any fires being built there. Just for show…which is what I use it for! So pretty! Our house doesn’t have a real fireplace in it either, and I totally understand why it feels like a disappointment. Thanks so much for sharing at the #happynowlinkup! I adore your mantel, it looks amazing. I cannot believe what people want to get rid of, so glad you got it! I love this! I’d love to do this is my guest room. 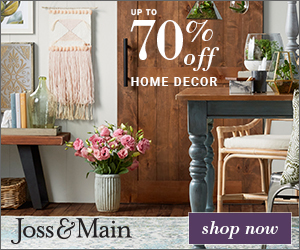 I’ll be keeping my eye open for a mantel! Thanks for sharing such beautiful inspiration. Lindsey, I like how you went after what you wanted to get that fireplace! 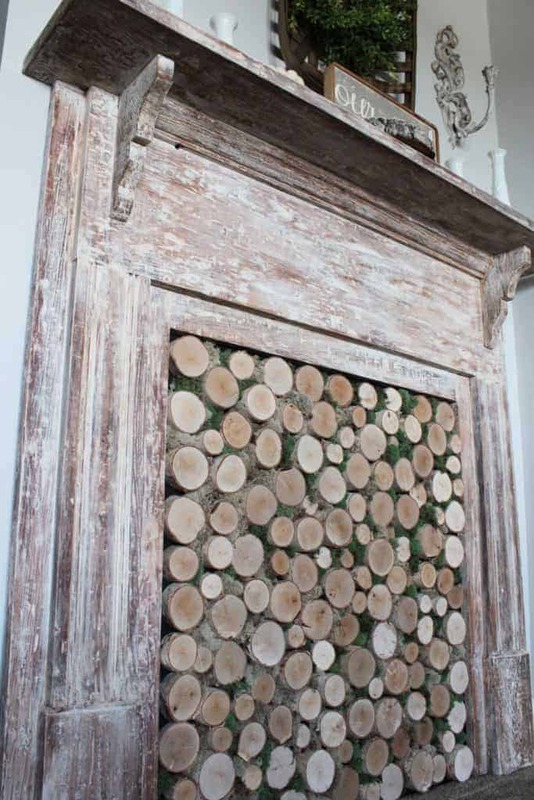 Innovative idea to add those wood slices to the front! I also like the white wash on the mantel. I’ve done wood stripping before & that is a messy job!! Pinned. Lindsey, I’m going to be featuring you at Sweet Inspiration this week! Love it! And what a steal! Those are going for $1,000 around here! Thank you! I would love to share at Home sweet home link party. Admire your determination, looks like was worth all your hard work.Your fireplace /mantel looks great now, finally get to decorate your mantel.You’ll be enjoying that wonderful well rehabbed , mantel for lots of years. Fun to decorate huh? We had a fireplace/mantel in our first mfg.home in MT, had 20 acres. Living room also was sunken so floor was closer to ground than would have liked,colder. Our first winter there in 1992 was one of coldest they’d had in years, 25 below during day for weeks in late Nov/early Dec. We moved to MT from San Diego, quite a difference but I loved it. Was coldest winter they’d had for while also.Our water pipes would freeze so had to wait to shower til mid afternoon when they warmed up a bit.Felt like a pioneer woman,lol. We now live in a single wide mfg.home in western CO, west side of Rockies, few miles west of Grand Junction on 1/2 acre out in rural area. No fireplace but do have shutter shelf which works like our mantel, decorate it for seasons, holidays. Wish I was back in MT but looks like we’re here for duration, Mr Furry says we’re too old to move back to MT. dadgumit. Hope you and yours had wonderful Thanksgiving.